A decade ago, interactive marketing was something we only saw in Hollywood films and video games. This success, and many others like it, was not a product of some kind of V.R.-enhanced magic we saw in the animation above. Zenni Optical used a 9-minute quiz, which was, certainly, beautiful and well-produced, but far from “high-tech”. It was a simple campaign almost any business could launch in a day with the right tools. Right – and yet, why are almost half of content marketers still hesitant to take the leap and start using interactive content – quizzes, calculators, interactive videos, knowledge tests – regularly? This is because interactive content is commonly perceived as complex and expensive to use. 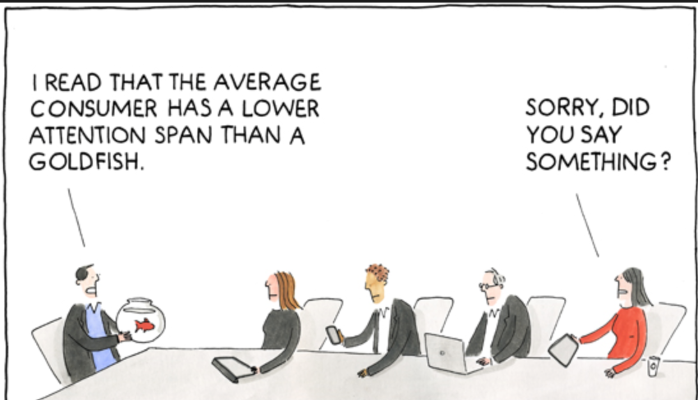 To a marketer or manager that’s already challenged by their content schedule, it’s just an extra burden – at least at first glance. In fact, if you’re trying to pitch interactive content to a client or your own team members, you’re likely to run into some resistance. This is the case for any new technology – and interactive content is no exception. Having said that, this branch of marketing is new – but not so new that there’s no data on it. To help overcome some of these common barriers, we have compiled a list of eight interactive content statistics that definitively show how useful and valuable it can be. These facts and figures can act as the leverage you need to persuade your organization, a client’s marketing team or your superiors to take a chance on interactive content. They show how the small risks are outweighed by massive potential returns – increase awareness, better educate and engage buyers, and capture more qualified leads for sales teams. Use the statistics to help sell, or justify, your investment in interactive content. Effective marketing is ultimately about making money. Not in the sense that marketing always has to drive sales, of course. What really matters is guiding users along a sales funnel or customer journey, and the above statistic illustrates why interactive content shines in this department. 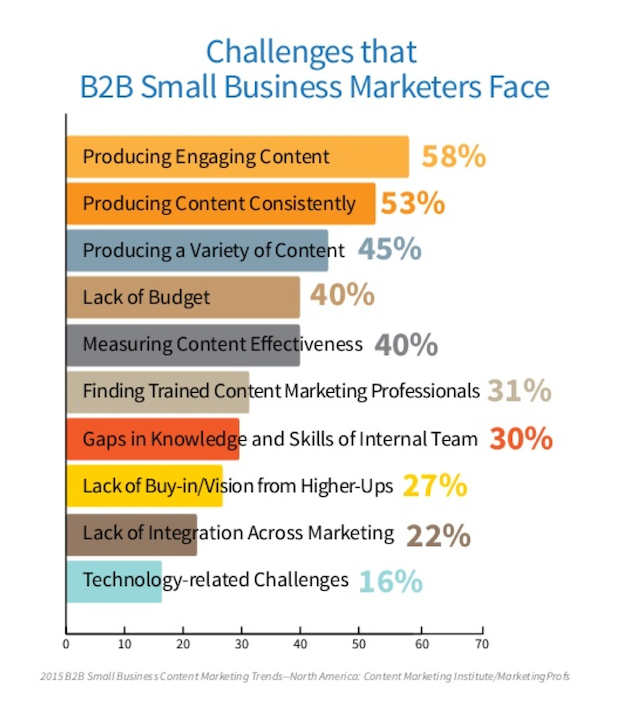 70% of B2B marketers are creating more content than they did one year ago. I mean, every single day marketers release over 2 million blog posts. These are vast numbers – and its just the tip of the iceberg. It’s fair to say that the internet is flooded with content. And, we’re not just talking static blog posts here. Other channels are becoming equally saturated. Probably the best example of this is the explosion of video content. People are now publishing over 300 hours of YouTube videos each minute, tallying over 49.3 years of video per day! Some of it is outstanding, some – sub-par, but all of it creates a torrent of noise that makes it hard for users to find and engage with your content. One solution is to use interactive content to create a two-way communication channel with your readers that helps you cut through the noise, better engage readers, and separate yourself from the competition. Quizzes are one of the more addictive and shareable forms of content out there. The lesson is that even simple interactive content can enrich your marketing efforts dramatically. 1. Graded quizzes – these give you a score you can then share on social media. 2. 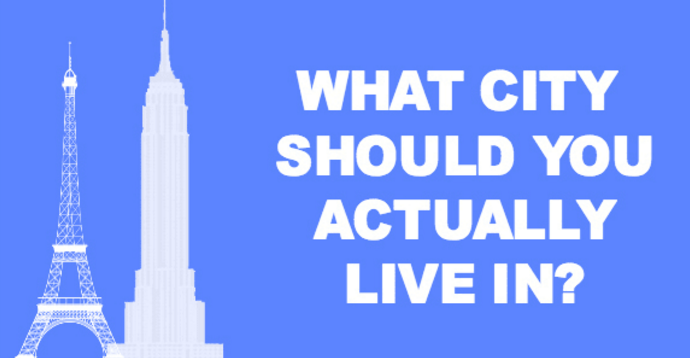 Outcome quizzes – these quizzes give an outcome, like the one above recommending which city you should live in. Newspapers and publications regularly used graded quizzes to enable readers to show how intelligent they are (and by extension, associate that level of intelligence with reading their paper). 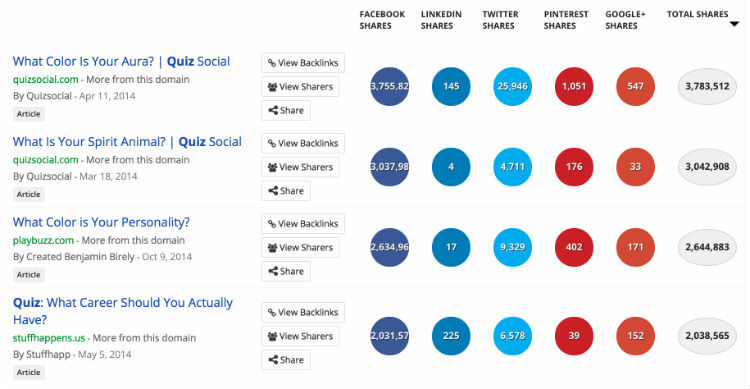 SnapApp’s clients have seen over 300% increases in engagement with quizz content. Interactive content is the key to cutting through the noise and grabbing users by the proverbial eyeballs. But engagement isn’t the only area in which interactive content shines. It’s also a powerful educational tool, as you’re about to see in the next point. Educating consumers is the foundation of any successful content marketing strategy. If you’re not providing valuable information, your audience won’t move further down the funnel, there’s no incentive for users to trust you as a brand – right? Since interactive content is over 33% more effective at educating buyers, it’s easy to see how it can improve your marketing. A lot of marketers are jumping on the bandwagon – 99% ramped up or sustained their use of interactive content between 2015 and 2016. And, that trend looks set to continue into 2018. The takeaway: The numbers don’t lie. There is a reason more marketers are incorporating interactive content into their campaigns, and ramping up that investment each year. There may be no better time to start experimenting with the medium. 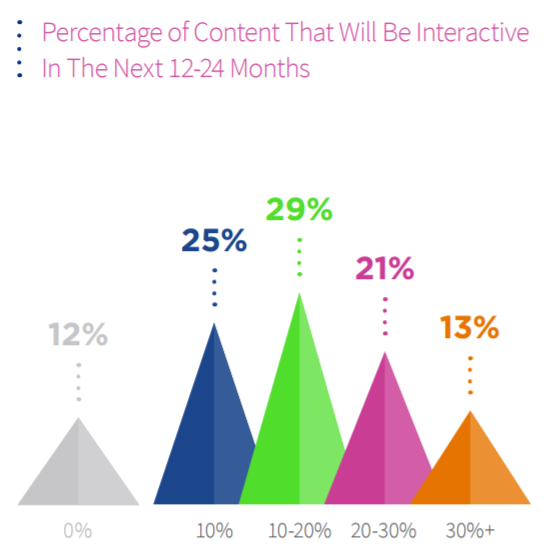 In the next few years, interactive content will get a lot more sophisticated and competitive. So, get on board now! Only 32% of marketers think they are creating enough content, which means a whopping 68% of marketers believe they’re falling short. You don’t have to start from scratch every time you start developing a new content strategy. Instead, it makes sense to repurpose your most successful static content into interactive forms that generate twice the conversions. Many of the interactive content types – like “Inception Explained” – can be used as lead generation and sales tools for up to 5 years. This means that interactive assets are perfect moving pieces for marketing funnels. They don’t need to be swapped out, updated, or replaced very often. It’s also worth noting here that different types of interactive content can be used to increase conversions in the early, middle and lates stages of the sales funnels. For example, while quizzes are great for generating awareness, they are not effective at the end of the sales funnel. Conversely, calculators can be used effectively across each stage of the funnel. Now, you may be thinking: this is all well and good, but this interactive stuff still seems pretty complex. Can I really succeed with it as a small or medium-sized business? And, here is a statistic to support the increased accessibility of interactive content. While there are differences in the strategic approach to B2C vs B2B marketing campaigns, the line is becoming more blurred. B2B business decisions are made by B2C consumers. This means all the regular challenges – content overload, short attention spans, and improved buyer education – are still at play. 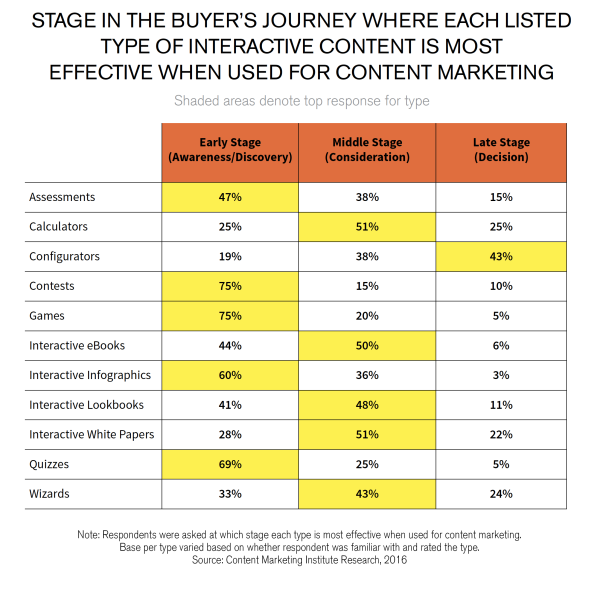 In fact, many will argue interactive content is more important in the B2B space. Buyers expect information now, as well as expecting modern, digital interactions in a B2B environment. Buyers don’t buy in isolation anymore. They leverage networks and online communities. The business landscape is changing from local to global. Need to go after a global landscape. Basically – B2B organizations need to understand what the customer is actually looking for. And, since 60% of B2B buyers have already made their purchase decision before ever speaking to a sales person, it’s critical that marketers are publishing engaging content that quickly educates the reader. The best way to do this is by using visual, interactive content types to create a two-way dialogue (not a one-way monlogue) between your brand and the user. 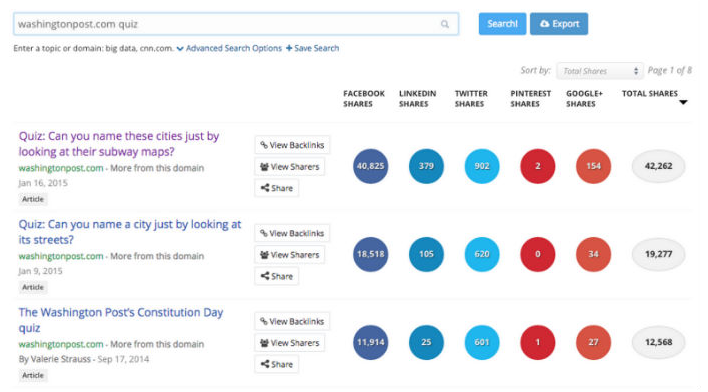 This means enabling user to directly engage with your content and get a personalized outcome. Most of our clients used to have the impression that interactive content is highly complex and you needed 5, 6, 7 and 8-digit marketing budgets to make it happen. It is by no means a “deal-breakder”. Quizzes: A quiz isn’t much different from a static blog post. You still take the same text content and images and/or videos; the main difference is doing a little extra research and programming during production. Interactive visuals: Animated images, when combined with text, are a very simple way to create interactive content – and they deliver many of the same benefits as, say, a virtual-reality enabled content ecosystem. Utilities: From calculators to automated SEO appraisal tools, giving people utilities that benefit their business is perhaps the single best way to make low-cost interactive content. Knowledge tests: This kind of content can be entirely text-based, which makes it easy to produce and release. These more formal alternatives to quizzes are a favorite of content thought leaders like HubSpot. Interactive videos: SnapApp makes it easy to create interactive video experiences – just upload your video and quickly add interactive features like buttons and opt-in forms to the video. If you’re on a small budget, or in the middle of a pilot project, you can also use YouTube’s features to make simple interactive video content.